INDIA, Jan 17 2019 - Over two days – 8 and 9 January – over 160 million workers went on strike in India. This has been one of the largest general strikes in the world. The workers, exhausted by almost three decades of neo-liberal policies and by the attack on the rights of workers, came onto the streets to make their case for better livelihood and workplace democracy. Blockades on train tracks and on national highways closed down sections of the country. 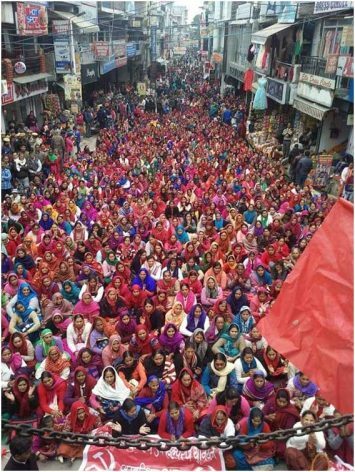 In Bengaluru, Information Technology (IT) workers joined the strike, while in Himachal Pradesh – see the picture above from the town of Hamirpur – workers gathered to demand an end to precarious employment in government service. Workers from a broad range of sectors, from industrial workers to health care workers, joined the strike. There has been no response from the government. Please read my report on the strike. My report is written from Kerala, where almost the entire workforce went on strike. This strike comes after the powerful Woman’s Wall that was built on 1 January to defend Kerala’s renaissance traditions. For a fuller sense of that struggle that brought five and a half million women to form a Wall along Kerala, see my report. The title for this newsletter comes from a well-known poem by the radical poet Vayalar Ramavarma (1928-1975). When workers struggle, Vayalar wrote, ‘isn’t it something to make the land proud’? This two-day strike comes as workers around the world greeted 2019 with a wave of demonstrations – from the ‘month of anger’ launched in Morocco by trade unions to the protests in Sudan over rising prices, from the potential strikes of teachers in Los Angeles (USA) to the potential general strike in Nigeria over wages. An International Trade Union Confederation report from last year showed that ‘More countries are excluding workers from labour laws’ – 65% of countries, at last count, excluding migrant workers and public sector employees and others from the rights afforded to them. There is every indication that the attack on workers’ rights and workplace democracy will continue despite the unrest amongst workers. Over the past several decades, women have entered public spaces to work and to live. They have established their talents, their skills, and their capacities in numerous spheres. There has been a backlash against this increased assertion. The backlash is shaped by extreme misogyny – or a strong feeling in sections of our society that women have a specific place and anyone who crosses the boundary is liable to be punished. These cultural walls behind which women and girls are expected to live (with some exceptions for certain classes), are stronger than the high walls of a prison. When a woman is raped, she is blamed for entering public space, for being a free citizen, for the clothes she wears, for the person she speaks to, for the place and time where she was. It is the woman who is held responsible for the crime. That is the character of the misogyny. 1. Because of India’s government policies, agrarian distress is acute: An average of 12,000 farmers committed suicide every year of this government’s rule. Unemployment is at its highest. 2. India stands out for its increased inequalities in this period of Modi’s rule. Just 1% of the population holds 68% of all household wealth, an almost twenty-point increase in the last five years. On the other hand, according to the government’s socio-economic survey, over 90% of India’s people have an income of less than 10,000 rupees a year (US $143). It is not axiomatic that high inequality and social distress lead to a progressive politics. In such a context, it is as likely that the culture of working-class solidarity erodes, and social violence grows, producing the seedbed of neo-fascist politics. To that end, Karat makes the case that the Left in India – but also elsewhere – needs to engage with the rigidities of our culture. Cultures promoted by capitalism and the market promote and glorify individualism and promote individualistic solutions. All these add to the depoliticization of a whole generation of young people. This is certainly a challenge: how to find the most effective ways of taking our message to the youth. Then again in India class exploitation is intensified through the caste system and vice versa. To build resistance struggles against the caste system and caste oppression and to link such struggles with the fight against capitalism in terms of struggles and goals is also a challenge. Trade unions and other class organisations certainly have to be more assertive and attentive to these aspects. The photographs in the dossier come from Rahul, an independent journalist based in Anantapur (Andhra Pradesh), whose work can be seen at the People’s Archive of Rural India.